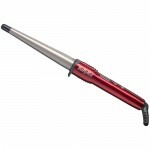 BaByliss have been market leaders in personal care appliances for decades since they began in France. They were acquired by the Conair Corporation (Previously Continental Hair Products) in 1995 and gave Conair a much need boost after several setbacks in the company’s history. With BaByliss under its belt, the personal care and small appliance company went from strength to strength. 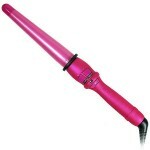 Let’s start with the most obvious thing about this hair curling wand; it’s bright pink. It doesn’t just have a pink handle, it is completely pink. Now this is fine, if it’s what you’re looking for, but those who don’t want a product quite so vibrant and possessing the ability to clash, may be put off. The handle is soft touch rubber though which is a pleasure to use and fairly uncommon in these wands. Another notable thing about this wand is that it has an extraordinary 25 heat settings which isn’t necessarily a good thing. Five heat settings is usually completely adequate and I don’t think that 25 is a particularly practical number. Sure you can choose the perfect heat for you but a more generalised approach would be more straightforward. The conical barrel is 32mm at the base and 19mm which allows you to get tight, small curls or larger, softer curls with ease. It only takes a few seconds to curl each section and there is a heat protective glove to aid the process – however the glove is a little odd and can be a bit awkward to get used to. The porcelain ceramic barrel gives a lovely smooth finish to hair and the curls are really resilient, staying in all day long and well into the next day if it doesn’t get wet. There is no clamp to cause kinks and you can wind the hair right to the cool tip. The porcelain ceramic is so smooth that hair does end up sliding around quite a bit, making it hard to be precise. Some wands come with silicone sections to keep the hair in place but this one unfortunately doesn’t and can be a challenge. The rubber handle makes this wand notably pleasant to hold and use but the odd glove and the slippery barrel may negate that plus point. 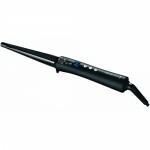 With care, you can get really nice and very long lasting curls from this wand and it heats up really fast. 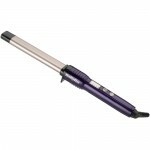 The barrel also gives hair a silky finish so it is worth the effort of trying to keep your hair in place. A little bit more expensive than other, similar products without much cause to be. 25 heat settings is a bit over-the-top and the rest of the features are pretty standard. Really, if pure pink is want you’re looking for then this is a winner but for everyone else – you could probably do just as well on a slightly cheaper model.